Welcome To This Wonderful, Fully Detached, Solid Brick Home In A Fantastic, Child Safe Cul-De-Sac In Bowmanville. Pull Up To This Beautiful 1770 Square Foot Home That Sturdily Sits In The Centre Of A Quiet Court. Park Your Car Either in The 2 Car Garage With Tons Of Storage And Outdoor Entrance, Or Pick A Spot On The 4 Car Driveway. There Is No Sidewalk, So There Is A Lot Of Room For You, Your Family, And Your Guests To Park. Before You Enter Through This Home, Notice The Inviting Front Porch, The Tasteful And Low Maintenance Landscaping, And The Friendly Presence That This Home Radiates! Be Welcomed Inside And Note The Rich Hardwood That Flows Through The Spacious Living Room To The Huge Separate Dining Room With French Doors. Imagine Your Family Dinners And Get Together's In The Big And Bright Kitchen With Newer Stainless Steel Appliances, And Open Concept Layout That Leads Through The Breakfast Area Into The Over-sized Private Pie- Shaped Lot With No Neighbours Behind! There is a Gas BBQ Hookup; A large Shed; A Gazebo That Rests On A Stained Back Deck; And Tons Of Space For Games And Entertainment. Upstairs You Will Find Spacious Bedrooms Including An Airy Master With A Lighted Walk-In Closet With Lots Of Space, And A Fantastic Renovated Ensuite With A Jacuzzi Tub! The Bedrooms Are All Beautiful, Roomy, And Comfortable! The Ultimate Man-Cave Is Found Downstairs. This Amazing, Roomy And Finished Recreational Space Features A Built In TV, And Yet Another Extremely Comfortable Bedroom With A Deep Closet And 3 Peice Ensuite! You Will Also Find A Supersized Laundry Area, And An Impressive Ultra Deep Cold Cellar! This Home Should Not Be Overlooked! It Really Has All Of The Updates And Renovations Needed For You To Recognize Its Value! It Has A 1 Year Old Roof And 2 Year Old Furnace, A Newer Gas Stove, Washer And Gas Dryer, New Garage Door, New Front Entry Doors, Renovated Powder Room, And Lots Of Love And Care Throughout The Years. It's Now Time To Build YOUR Memories In This Cheery Home. Build Memories In This Cheery 1770 Sq' All Brick, Solid Detached Family Style Home Situated In Quiet Court, On A Private Pie Shaped Lot, With No Neighbours Behind. Functional Layout Features Rich Hw Flooring, Spacious Living Room, Separate Dining With French Doors, Lovely Open Concept Kitchen With Ample Storage And Connected Breakfast Area. Large Master Shows Off Walk-In Closet & Ensuite. Inviting Bedrooms. Completely Fin Bsmt W Laundry, Bdrm & Cold Cellar. 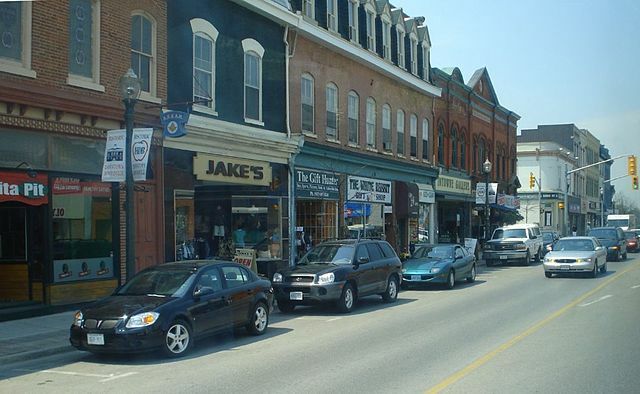 Bowmanville is the largest community in the Municipality of Clarington. It is approximately 75 kilometres east of Toronto, and about 15 kilometres east of Oshawa, nestled along highway 2, just north of Lake Ontario. Bowmanville is considered a part of the Greater Toronto Area. The region has recently experienced large growth and development due to its ideal access to the nearby urban centres along highway 401. Bowmanville has a great diversity of amenities in town and nearby, while still maintaining its small town charm, making it an increasingly attractive community to raise a family. Bowmanville’s history began with the arrival of the first European settlers in 1794. Three loyalist families from the U.S. were the first settlers to arrive, the Burks, the Conants and the Trulls. The village grew and prospered attracting not only settler families but industry too. Mills, furniture factories, tanneries, brick yards, evaporator plants, hotels, inns, and mercantile establishments were all a part of the growing industry in Bownmanville. Some of Bownmanville’s most famous industries include: The Dominion Organ and Piano Factory, The Goodyear Rubber Plant, The Bownmanville Foundry, and The Cream of Barley Mill. The goods from these places were shipped worldwide. The Bowmanville Museum holds the rich history of the town, and the story unfolds through a photography collection. Bowmanville offers plenty to do and see. The annual Apple Festival and Craft Sale takes place the Saturday following Thanksgiving. It is a street festival that celebrates all things apple. Four city blocks are converted to a showcase for the many talented local apple growers. Unique handmade craft items and food products can be found in several booths along the street. There are plenty of things for children to do such as carnival rides, bouncy castles, pony rides, and more. Summertime in Bowmanville is an exciting time with the Annual Summerfest. It is a 3-day sidewalk sale. You will find great deals from the unique businesses and services in the area. Another unique event is the BluesBERRY festival, which celebrates blues music and berries in a unique and fun family event. Downtown Bownmanville offers plenty of unique shops and restaurants.